ANNUAL MEETING CHANGE OF VENUE! Last month we mailed hard copies of the newsletter to all current paid members. We may decide to mail the newsletter from time to time if the issue warrants it. PLEASE let me know your opinion about this, and if you would like NOT to receive hard copies of newsletters in future, please send me an email to that effect and I will keep you off the mailing labels. Please join us on Tuesday, October 20th for the Annual Business Meeting of the Organization of Women Architects and Design Professionals! We will be voting on new members to the Steering Committee and the annual operating budget for 2016. We will also be discussing any programs and ideas you would like to see for 2016 and discussing some exciting new projects the Steering Committee has been working on. The business meeting is one of the most important OWA+DP events of the year because it is an opportunity for our members to give feedback to the Steering Committee. This helps the Steering Committee to make decisions on behalf of our members over the next year. Its is incredibly important to hear from our members about what they enjoyed this year, what they’d like to see more of in the future and any areas that we should focus on to improve our organization. If you cannot attend the meeting, but would like to vote in the Steering Committee election, contribute an idea or have an issue you would like to see addressed, please contact a Steering Committee member. 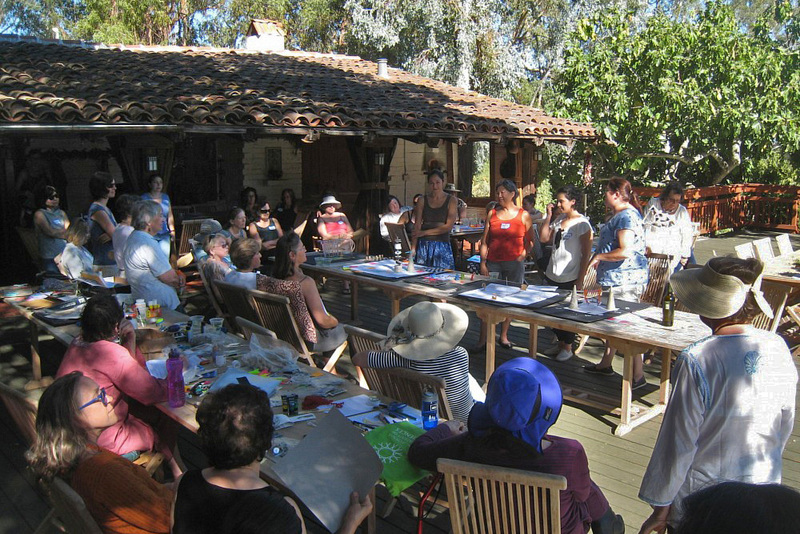 This years meeting will be held at Lucia Bogatay’s house in the Mission District in San Francisco at 3676 20th Street. This is between Valencia and Guerrero, and equidistant from two BART stations, and just two blocks east of the J Church MUNI stop at the top of Dolores Park at 20th Street. Parking is available at the 21st and Bartlett city garage. . We will be electing four new members to next year’s Steering Committee, You can read the personal statements of our Steering Committee candidates below. If you would like to run for the Steering Committee or if you would like to nominate another member it’s not too late to volunteer (contact Allison Kinst for any questions). I look forward to seeing you all on the 20th as we prepare for another great year! One of the benefits of being Steering Committee members is free attendance of the OWA/DP Retreat! It is hard to over-estimate the pleasures of that wonderful event. For me, the companionship of many intelligent and accomplished women is one of the biggest pleasures. The Retreat also offers an interesting topic, an art project, exercise and a healing atmosphere for our hardworking members. Westerbeck Ranch is delightful. It is a 1920's creation by the grandfather of the current owner, built in a relaxed Mexican style. The educational and physical challenges brought on by trying to learn a new dance are a regular feature. This year, it was the Samba. A rapid Darwinian process quickly eliminated those of us with extra left feet, and we watched spellbound by the 12 or so remaining dancers, who really knew how to do it! The Band was great. Following are statements from the five candidates for four positions on the Steering Committee for 2016-17. The election is October 20 at our annual meeting. PLEASE NOTE THAT THE VENUE FOR THE MEETING IS CHANGED TO 3676 20TH STREET in San Francisco, This is between Valencia and Guerrero, and equidistant from two BART stations, and just two block east of the J Church MUNI which stops at the top of Dolores Park at 20th Street. Parking is available at the 21st and Bartlet city garage. Designing has always been a part of my life, whether I knew it or not at the time. From having mini-meltdowns every time my parents made me clean up my Lego mansions, to pulling all-nighters just to make my school project posters look perfect, it was clear that architecture was my destiny. The dots didn’t fully connect until high school when a classmate accidentally signed me up to design and build a set for the school play. I dove into a world of designing space head first, and I never turned back. I proceeded to earn a Bachelors of Arts in Architecture from UC Berkeley in 2013, and now work at Christiani Johnson Architects. I am excited to be applying for a position in the steering committee because I want to be more involved with in an organization of strong and inspiring women. I met some amazing women at this year’s retreat, and coming out of it I knew I wanted an opportunity to work more closely with them. What I will bring to the steering committee is a young energy, and will translate this to recruiting more young professionals to the organization. I will also bring my experience from running other organizations like American Institute of Architecture Students (AIAS) and Alpha Rho Chi (APX, Architecture Co-ed Fraternity) into steering committee operations. In AIAS, I served as the Vice-President where I was in charge of organizing events like firm tours and portfolio critiques. In APX, I was the Secretary, where I was in charge of meeting minutes and tracking member participation. In addition to my leadership skills, I am currently building up my skills in web design, which will allow me to easily communicate with the web designer and assist with programming. 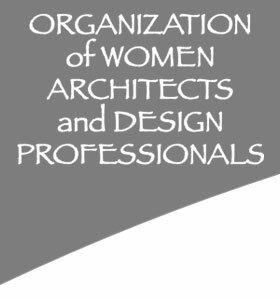 I am excited by the opportunity to be a part of the Organization of Women Architects and Design Professionals, and hopefully the steering committee as well! I am a licensed architect living and working in Oakland. I have a M.Arch and BA in Psychology. Before entering architecture I was a high school teacher in SF and a Peace Corps volunteer in Swaziland, Africa. My background in psychology, education and public health informs my conviction that good design is critical to our mental and physical well-being. I work as a project designer at Lowney Architecture, where I design and manage commercial, residential and community projects. I have always cherished my relationships with the women in my life and I strongly believe networks of women can accomplish great things together. I look forward to becoming more directly involved with OWA and hope to help expand and deepen the organization as new members are integrated to guarantee its sustainability. I would love to see more events throughout the year, such as more architectural and hard hat tours, and also joint events with organizations of related industries. Hm..sounds like I'm interested in a Program Coordinator position. I am an architect, artist and educator with more than 30 years professional experience in the US, the UK, Japan and Australia. 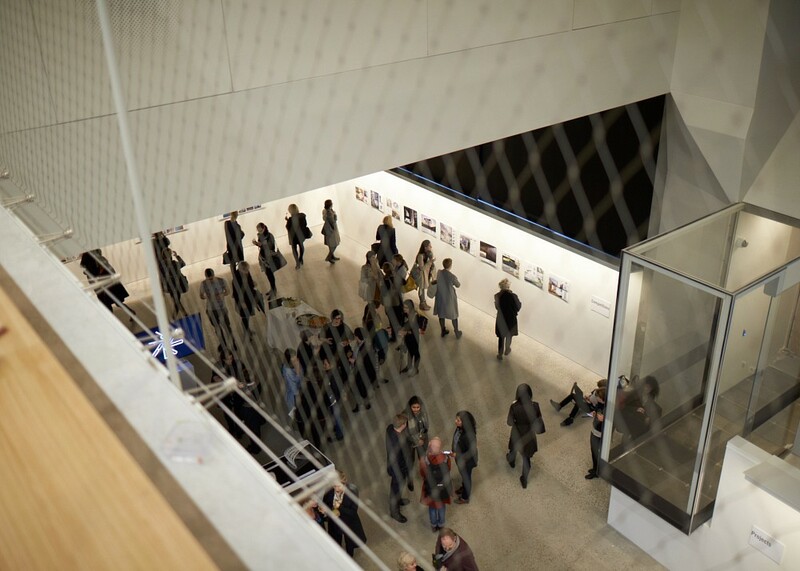 I have worked in architecture practices in San Francisco, London and Tokyo and taught architecture at the University of California Berkeley (as a graduate student), the Nagaoka Institute of Design, the University of Western Australia and Kingston University London, where I ran the Master of Architecture (Design) program from 2004-2014. In 2004, I started my own art and architecture collaborative practice, through which, working at the intersection of art and cities, I seek to create thought-provoking interventions in situations and places of everyday life. My practice engages a variety of time frames – ephemeral, temporary and permanent – and ranges in scale from drawing and photography, sculpture and installation through to interior design, architecture and urbanism. As a young architect starting my career in San Francisco in the 1980s, OWA gave me many invaluable opportunities to meet other women professionals of all ages and to hear and learn from their experiences. Over the course of my career, I have relied on many of the things I learned through OWA. And, I am now very happy that, if elected, I would be able to give back to the organization and its broader community by serving on the steering committee. I bring lots of energy, extensive experience of working in various environments, knowledge of professional practice in different countries, lots of teaching experience and a heartfelt desire to be available as a mentor to younger members of the professional community. When I first came to the OWA it was a revelation to me to find so many women architects. Being a part of this organization has given me the encouragement to thrive in my career as an architect. If not for the direct encouragement of Sigrid Rup, Lisa Kleisner and many other OWA members I may never have had to courage start my firm, probably the best career decision I’ve ever made. I’m grateful for the personal and professional support. The OWA is important to me and I believe it is relevant to the future success of women in architecture. As a member of the steering committee, I hope to focus on positioning the OWA to offer support to women in their careers. Although I’ve enjoyed the retreat for more than 20 years and have served on the 30th and 40th anniversary celebration committees, in all these years, I’ve never served on the steering committee. I’m running for a position on the steering committee because I’ve reaped the rewards and enjoyed the hard work of others. Its time I offered to serve. I grew up in Saudi Arabia. My first degree is in International Business Management. While I was still living in Saudi Arabia I had an opportunity to work for a non-profit organization who reached out to impoverished communities and help support underprivileged women by providing knowledge and resources to help them develop and gain economic strength. I was responsible of the organization’s marketing and events planning. After a while I decided to move to the United States. Thus, in 2010, I enrolled in Dominican University’s English program. During this time at Dominican, I was given the chance to learn more about American culture and to share with my fellow students my culture as well. As a result of that experience, I started the school’s Muslim Student Association. In 2012, I enrolled in the interior architecture graduate program at the Academy of Art University where, ironically, I learned that space planning can’t be an administrative decision. Currently, I live in San Francisco and work as a designer at Barcelon Jang Architects. I’m would like to be on the Steering Committee so I can share my knowledge and experience with OWADP members, but also to educate myself further as a designer and to participate in a great variety of well-established women architects and designers. I believe I can help invigorate membership in OWADP by enticing more members to join the organization. My strengths are my marketing and social media skills along with my ability to plan events/programs. The Topic for the weekend, Creativity and Play, was orchestrated by Gretchen Addi, a principal of IDEO, a global innovation and design firm. Ms Addi spent some time making us more familiar with what they do and how they do it. We learned that IDEO makes imaginative use of human interaction to stimulate and harness creativity and solve problems for government, industry, business and education. Addi Iat length the kinds of projects and the ethos of the firm. She introduced us to the design process they use: It begins with "Ideation," a form of brainstorming and collection of ideas without limitations or judgements, testing feasibility (finding the best approach), and working out the design. The company uses people, space and process in ways to facilitate the development of creative solutions. Following her talk, Addi divided us into groups at brown paper covered tables with pens and colored dots, and instructed us to record our notions of how the design process can be enhanced using play, interaction of people, inovative places and processes (not her exact terms, but close). We OWA/DP members demonstrated our own creativity as we recorded our insights into collaboration and the design process that we use as architects and designers, writing notes and drawing on the brown paper and adding colored dots to indicate agreement with a particular point. 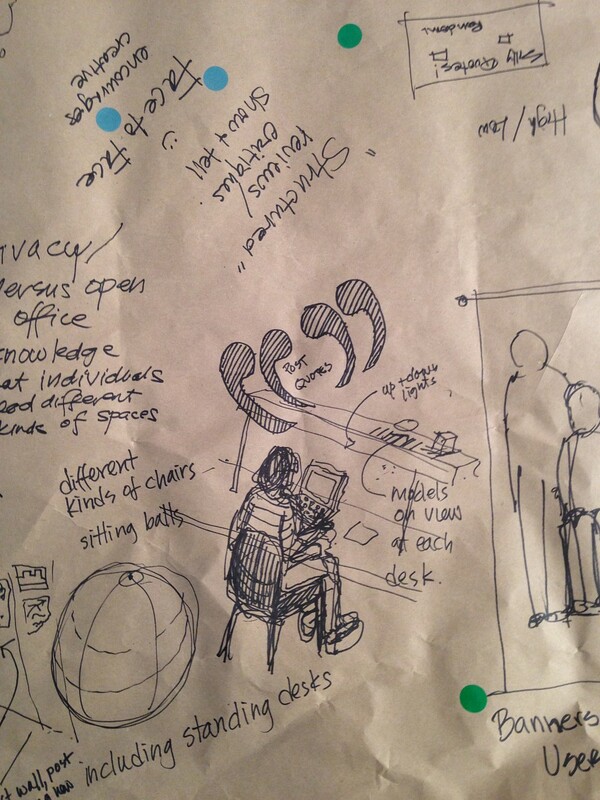 Work Spaces: This topic generated much drawing and discussion. Workplace should be flexible and not static. Furniture on wheels allows for modifying space, people should be encouraged to move around, changing combinations of collaborators. Comments advised avoiding the formal, encouraging the informal, personalizing, and allowing pets and babies, encouraging interaction using encounters, bulletin boards, post-its, chalk boards. Emphasis was on variety: a variety of spaces and levels of privacy, a variety of chairs, “sitting balls” to encourage both comfort and healthy movement, a variety of heights of working surface, flexibility. for individuals, teams and presentations. Provide calibrated scale on wall and cutouts of people to help visualize results, provide places to tape out full sized mock-ups. Install banners with images of the users. Perhaps as inspiration, and to remind people who they are working for. People: Much discussion of teams, their composition and function, the importance of having “good people” on the design team, and having a variety of points of view, ages, disciplines and ethnicities. Building team morale and excitement about the project and process was noted. All participants need to respect other participants and be respected. But must allow people to be “human.” Some consultants could be short term team members. There was emphasis on the value of humor, and playfulness, and both being accepted rather than being suppressed. Get to know the people with whom you are collaborating, for whom you are designing, perhaps in an informal setting. All team members need to meet client. Have lunch dates with participants, have work space which encourages a variety of interaction with a variety of people. Maintain team cohesion by cooking together, and try sketching on Fridays during lunch hour. 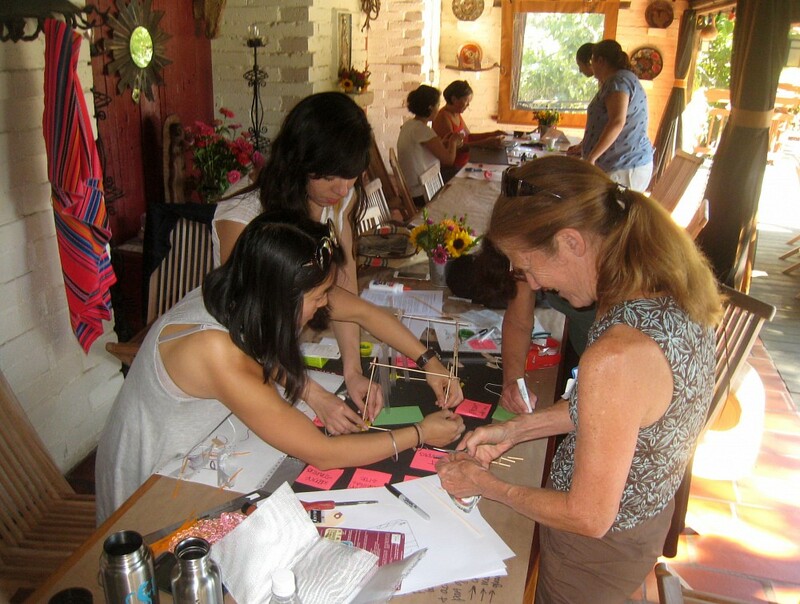 Process: At the Process tables, people considered what process or activity would promote the creativity of both the team and the client. There was a lot of emphasis on the use of creativity and play, and on changing the environment in which the work is done. Play includes music, fighting, doodling, changing the light levels, or varying them throughout the environment, The space becomes the metaphor for the process, being broken up and reconfigured in response to the creative impulse. According to the notes on these tables, the goals include: remaining open to new ideas, staying loose, not becoming defensive, and being non-judgmental. Activities include gathering information, visiting sites, talking to users, locating good existing examples of the project type, and assembling good team. In connection with this year’s retreat theme of “Creativity and Play”, we gave the following prompt for our art project: What could we put out in the landscape at Westerbeke Ranch such that when guests come across it they have a playful interaction with it? What is it like to play as an adult? Participants spent the afternoon in an open-ended playful exercise to generate ideas and discussion for small landscape interventions that might be built at Westerbeke – ones that guests would notice and that would inspire interaction. Working in small groups for about ninety minutes, we met to brainstorm initial ideas and select one of three appropriate locations proposed by the owner, select materials and an approach for modeling or conveying the idea, and set to work building. 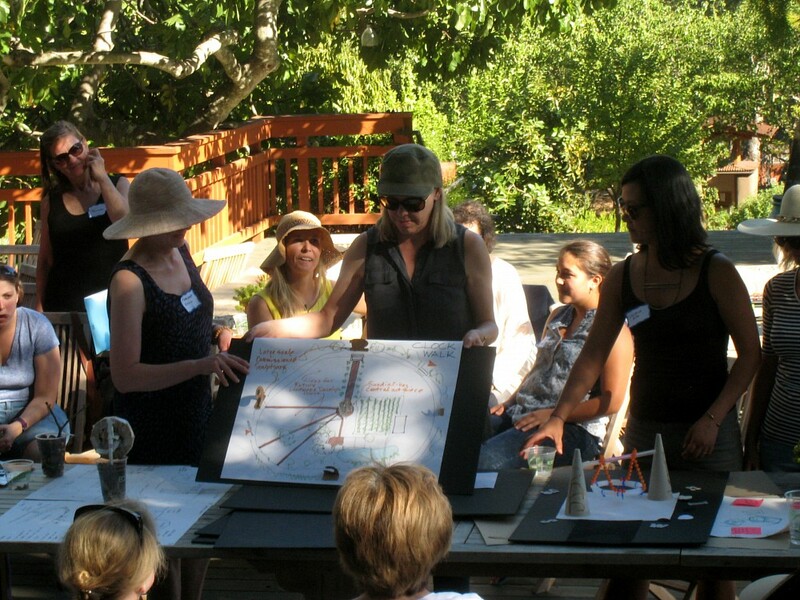 Each group then presented a model or sketches and a pitch for their idea to the larger group and Wendy Westerbeke, who joined the discussion and delighted in the possibilities. Several groups modeled interventions at the Reservoir, including exploring the reservoir via cards that take you on a walk to a sequence of spots prompting additional actions; play areas such as hammocks and a swing where you get misted; a central climbing structure and platforms at different levels; and a large scale sundial and “clock walk.” Another group suggested small, sculpted creatures throughout the site that connect you to a succession of features–a Westerbeke Wild Things treasure hunt. One group proposed a giant slingshot with target made of materials already on site; a stump section as target, a forked branch as sling shot, and using the local acorns as ammunition. Others presented ideas for developing the fire pit area as a contemplative place for small groups, adding a fragrant sensory garden, a kinetic canopy, comfortable seating and a focal point honoring Wendy’s grandfather. OWA members have enjoyed a long history of retreats at Westerbeke Ranch and the group has contributed significant landscape pieces, building the labyrinth in 2003 for our 30th anniversary and the Thyme Garden in 2013 for our 40th. THANKS to Janet, Gretchen, everyone in the retreat committee, our fabulous evening band Homenagem Brasiliera, and Michelle Morales, who prepared us for the evening with an upbeat dance workshop Saturday morning. PARLOUR: a space to speak – bringing together research, informed opinion and resources; generating debate and discussion; expanding the spaces for women in Australian architecture......and around the world. Archiparlour.org has been a great source of motivation and information about changing the architectural profession, so women will be valued as equals. Check them out. Now they have made a call for partnership and I think OWA & DP would be well served to become one of the Parlour Partners. "Join us as a Parlour Partner! We now have a Parlour Partner program. Together with Parlour Friends, this enables us to continue delivering significant discussion, research and resources, and to help build communities and networks for those committed to a more equitable profession. The Parlour Partners program offers three levels – Principal Partners, Corporate Partners and Institutional Partners. This is the premier partnership arrangement, which is recognised as supporting all Parlour work. It provides broad access to a highly engaged, committed audience. Corporate partnerships are generally associated with particular projects and inititiaves. These are tailored to suit the budget and commitment of the partner, and the alignment of these interests with the needs of Parlour. Institutional Partnerships enable us to work closely with universities, professional organisations and government bodies . This enables Institutional Partners to extend their reach and industry engagement, while assisting Parlour with research, education and communication. Why become a Parlour Partner? When you become a Parlour Partner you join excellent company. It is an opportunity to work with like-minded organisations in building a fairer, more equitable, and more sustainable profession. We are delighted that the Australian Institute of Architects has joined us as Parlour’s inaugural Principal Partner. We look forward to developing further relationships with new Principal Partners, Corporate Partners and Institutional Partners. Read Why Parlour, download the Parlour Partners overview and contact us for details on the different levels. The Parlour Partners package of benefits and recognition will be tailored to suit your organisation and situation." A good topic for October Business meeting and beyond. We will discuss topics from Gender Intelligence by Barbara Annis & Keith Merron (Harpers & Collins, 2014) OPEN TO ALL. The authors highlight research evidence from brain structures, functions, and hormone chemistries and claim they are reliable indicators of common gender behavior tendencies. Annis and Merron argue that rather than force-fit what’s not authentic, let’s understand some basic biological factors like how women and men communicate, listen, solve problems, make decisions, handle emotions, deal with conflict, and manage stress differently. Understanding, valuing, and paying attention to each others ways of doing is helpful. In fact, the most successful, satisfying, and profitable businesses employe equal numbers of men and women at every level of the organization for the complementary results of gender difference. In spite of the evidence, as we in OWA know, architectural firms have been slow to embrace this concept. It follows, that not only do we need to be gender intelligent as individuals, but also as design professionals with influence to translate social considerations into meaningful planning, programming and designing of buildings and places. Come to the 4th floor Sycip Room located next to the Page Desk of the San Francisco Public Library, 100 Larkin Street Steps away from the Civic Center BART and Muni stations (enter at 30 Grove Street and proceed to elevator or stairs). Note that the lead Architect Cathy Simon was a founding member of the Organization of Women Architects & Design Professionals (1973) and still practices today in the area. No food will be served but for those hungry, we will go to a nearby restaurant afterward. Darlene Jang, a long time member of OWA/DP, is a Berkeley Architecture graduate, and daughter of an architect. Her mother was from Shanghai, her father from Guangdong, a combination which gave her an even richer cultural outlook, and an elegant sensibility. Next year Barcelon Jang Architects will wcelebrate 40 years as a firm. Darlene and her partner Wayne Barcelon, won a competition (for the Triton Museum), and started a partnership in 1976. Originally specializing in museum and gallery design, their work has been characterized by elegance and high style. Their work has developed a specialization in academic and community facilities, supportive housing, and museum and gallery architecture. The partners have designed such acclaimed and award-winning projects as the Chinese Historical Society of America Museum, the San Francisco Tenderloin Community School and Child Development Center and the Triton Museum of Art, Santa Clara, CA. (B+J brochure). Darlene is a powerful advocate for women and her practice mirror’s her commitment both to excellence and to women professionals. She is one of the original founders of OWADP and has put tremendous efforts into the support of women architects. She continues to be active in the architectural community being on both the California council of AIA and on the Board for the American Asian Architects and Engineers. The past year has been a particularly special year for Darlene, she married her longtime boyfriend Bruce and her daughter gave birth to her first grandchild. True to her feelings toward women in architecture Darlene has hired several of our members and been a mentor to many others.